Select the date and the number of people enrolling, then place your order. Enrollments are handled through Eventbrite, a secure 3rd Party registration system. Neither DESARA nor Eventbrite will retain your credit card information. 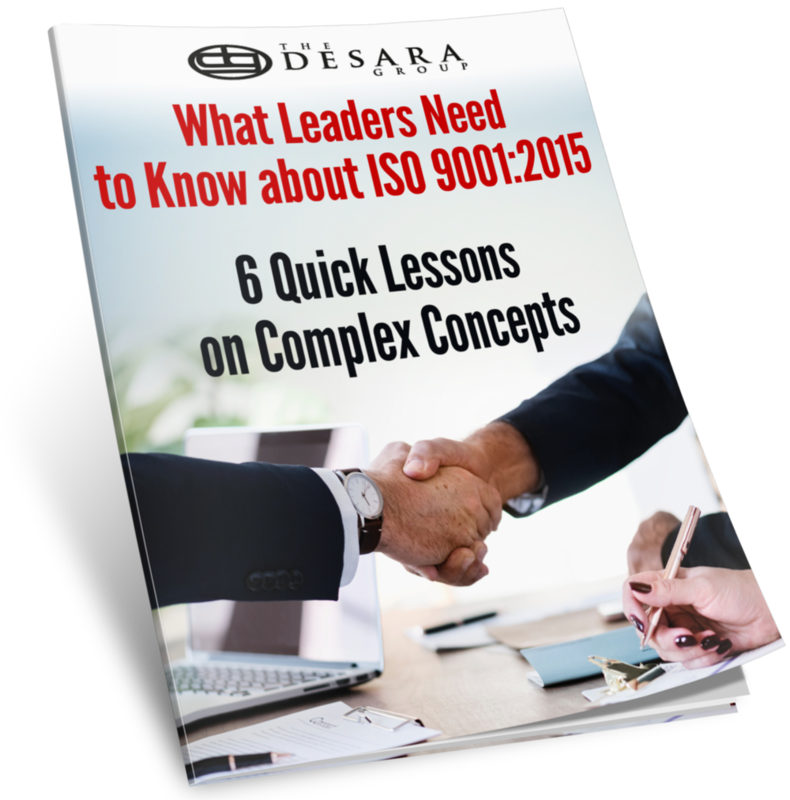 This course is for managers, directors, and above who need to generally understand ISO 9001:2015; a basic familiarity with ISO 9001:2008 is expected but not necessary. Check out our other courses for more detailed information for new internal auditors and ISO 9001 users, implementation teams, and managers. How can I attend remotely? We'll send remote access instructions to all registered participants. That way, if you are unable to attend in person you'll be all set to join us from your computer or mobile device. We use GoToMeeting and you'll be able to join in the discussion wherever you are. Absolutely. You can transfer registration to a colleague without a change fee, or reschedule up until 10 days of the start of the class to a future session for a 10% fee. Cancellations and reschedules within 10 days of the start result in a 50% refund. Yes, and we encourage you to attend with colleagues so that you can work together to use the training back on the job. We offer a 10% discount for the third person from your company, and 20% for the fourth. For 5 or more participants, consider holding the class at your business location to maximize savings. Give us a call at 631-909-3570 for more information. What's included/not included in the course fee? Where will the training take place? The name and address of a hotel near DFW Airport will be communicated to registered participants within 2 weeks of the start of the program. You can attend this live event remotely if you choose. We use GoToMeeting and will allow 2-way communications. All our courses are fully customizable and can be brought to your location.